The belief that the mind does not exist apart from the brain dominated the twentieth century. But can we really dismiss our thoughts and feelings, or furthermore, our religious and spiritual experiences as simply outcomes of the firing synapses of our brain? 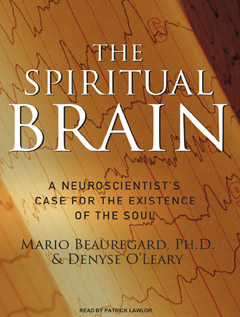 In The Spiritual Brain, authors Dr. Mario Beauregard and Denyse O’Leary present the groundbreaking evidence that the mind cannot be simply reduced to physiological reactions in the brain. Most neuroscientists are committed to the view that mystical experiences are simply the result of random neurons firing, or “delusions created by the brain.” The Spiritual Brain takes another approach, powerfully arguing for what many in science are unwilling to consider—that people actually contact a reality outside themselves during intense spiritual experiences. Beauregard uses the most sophisticated technology to peer inside the brains of Carmelite during a profound spiritual state. His results and a variety of other lines of evidence lead him to the surprising conclusion that spiritual experiences are not a figment of the mind or a delusion produced by a dysfunctional brain. — Andrew Newberg, M.D. Associate Professor of Radiology and Director of the Center for Spirituality and the Mind at the University of Pennsylvania.and co-author of Why We Believe What We Believe.